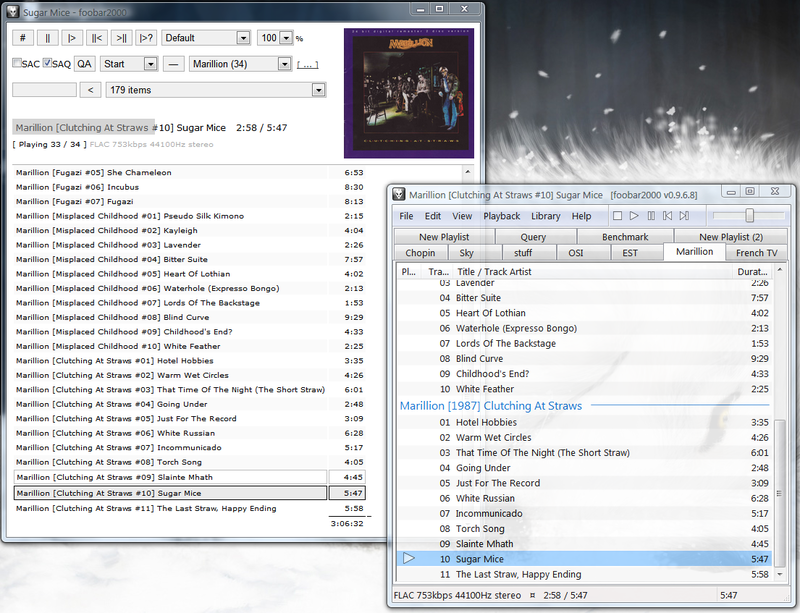 This foobar2000 1.0+ component is developed as replacement for Media Player Classic web control interface, which I used quite a lot, but still didn't like it, as it missed quite a number of features I'd like to have. Also I felt it's a shame such great player as foobar2000 couldn't be remotely controlled over http nowadays. So, erm, I went ahead and somehow developed component featuring functions I use by myself on everyday basis. - a few UI custimization abilities. Illustrated beginner's guide to the component. I couldn't get this to work. It connects but i just get a blank page. by default it is configured to be available on network interfaces via port 8888. http://127.0.0.1:8888/ should work. do you see 'Bind successful' message in File/Preferences/Display/foo_httpcontrol page? by the way, check foobar console for any error messages -- perhaps there is a problem with template files loading, they are expected to be found in foobar's components directory. Extremely useful....have been using it for a long time...makes things a lot more productive...thx for the update! Wow!! amazing... Thanks a lot ! Using it via wifi from my Palm browser, I can't change volume (although I see the vol box) and I can't seek... everything else works fine and fast! Do you have an idea of what could be causing this behaviour? Were really close to the perfect remote control to foobar!!!!!! There is a simple link to an MP3 file on the page. I'd like to click on it, and have it played through my Foobar player. Is this what your control does? I downloaded and installed it, taking the default preferences, but I still get the same Opera error: "You need a plugin to view .... blah blah blah ..."
If your control does not serve this function, do you know how I can get thes clips playing from within Opera? I like the idea but with 70% cpu utilization when playing and the same blank page problem as has been reported by others I'd say you've got some more testing to do. I'll definitely keep an eye on this. :) Keep it up! well, I have no idea about issues of palm browser. perhaps it doesn't recognise onchange event in dropdown list? all I can offer in this case is to provide opportunity to raise/lower volume level by a certain amount via buttons, instead of dropdown list. regarding the seek issue, it's a difficult question, as a matter of getting mouse coordinates is a weird issue even for pc browsers. I guess you'll have to do some research on this topic, and modify JS template section by yourself. and thanks for the dir enqueue note! A little feedback after some testing. In Firefox 2.0.0.13, volume and playback order dropdown boxes do not have any effects on foobar (i'm using foobar 0.9.5.1 with ColumnsUI 0.3 beta 1 preview 4). I also tested it in IE 6 and it works correctly so it's maybe something i should change in the templates to make it work with Firefox. Also it seems there's a sorting problem when browsing folders and files on a network. They are sorted randomly in both IE and Firefox. yep, replacing all occurences of 'this.document' to just 'document' in control template should solve this. btw, Chipicui, it might help with half of the problem you are having with palm browser too. thats definitely weird, as I actually don't sort files in any way -- I just display what FindFirstFileW/FindNextFileW API functions return, and they do actually return alphabetically sorted data on my winxp sp2. whats the specifics of your OS? In fact, my files which are stored on the network are on a network drive (Synology DS207) which seems to have some linux version as OS. Otherwise the OS of my computer is XP Pro SP2. About the functionalities of your plugin, do you have already done what you need or do you still consider feature requests ? eh, my bad, actually. seems like file order is not guaranted, according to documentation. no big deal anyway, I'll add a compulsive file list sort. to be honest, this thing satisfies my own needs by around 90% as it is now, but I wouldn't mind hearing suggestions as I still have some interest in messing with its development. Useful plugin, I want to use it with my PSP, as a remote. Thanks for the plugin. One suggestion though: add the option of requiring a user name and password to access the page. and my sorting problem on network is gone now. Great ! Don't know what kind of magic you did to the template's code but now EVERYTHING works in my PalmTX. Thanks to you, now I can have a fast remote control for foobar! One suggestion if you really want to go the extra mile: could you implement a drop-down list (or simply another web page) to change the active playlist? How do you filter a folder to enqueue (for example)... only mp3 files?